Founded in 1692, Mission San Xavier del Bac is situated in the center of a Papago Indian settlement, along the banks of the Santa Cruz River, approximately seven miles south of present day Tucson, Arizona. Construction of the mission required 14 years of labor from 1783 to 1797. The mission has been restored many times and has retained its beautiful, white, stucco exterior. 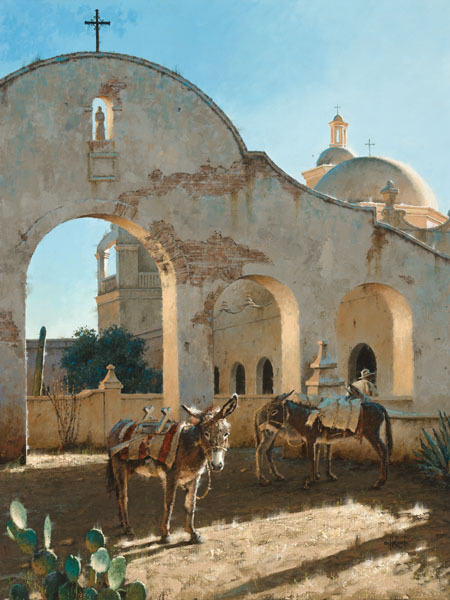 This painting depicts the late afternoon arrival of supplies by burro caravan; while being unloaded, the donkeys are enjoying the "Shadows of San Xavier".